Light Night: Hundreds of walkers create dazzling display – Mend Mountains. Make One Million. Last night 600 people came together to create a spectacular show of support for Mend Our Mountains – a human light chain stretching for two miles. Now is your chance to get a memento of the event. 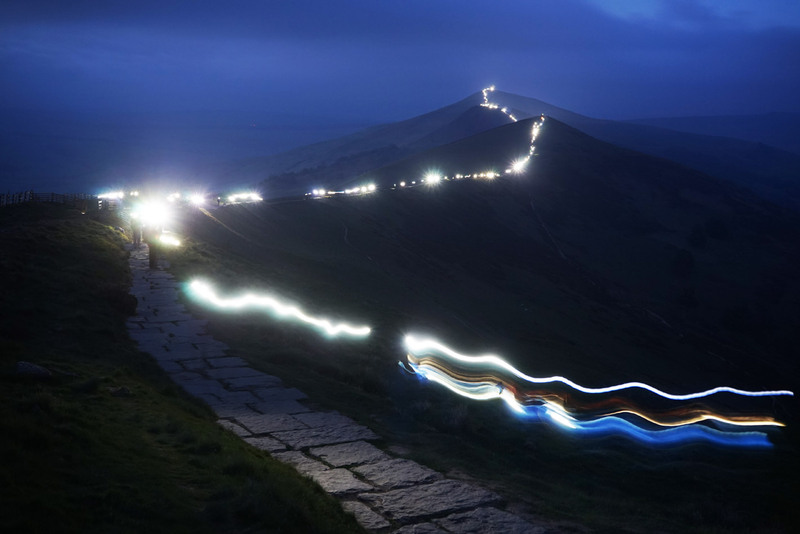 Joined by the unlikely duo of TV presenter Julia Bradbury and Made in Chelsea’s Sam Thompson, the ‘Great Ridge Light Night’ saw a line of hundreds of people illuminate the two mile length of the famous ridge from Mam Tor to Lose Hill. The event highlighted the message of the Mend Our Mountains: Make One Million appeal and encouraged people to explore the UK’s amazing outdoor spaces during National Camping and Caravanning Week, which is led by The Camping and Caravanning Club. The buzz from the event is already spreading far and wide, and it will live long in the memory. Now is your chance to get a souvenir of the event by buying a high quality print of one of the spectacular photos taken on the night. All profits from sales of the prints will go towards the Mend Our Mountains: Make One Million appeal, and help to repair exponentially worsening erosion damage in some of our most treasured landscapes. Tom McNally’s photo of the Great Ridge illuminated with a two-mile long line of lights, taken from Mam Tor. We’d also like to give a huge thanks to everyone who took part last night. Volunteer participants were treated to a spectacular sunset and a clear night but had to cope with gusty winds and cold temperatures for several hours. The event ran smoothly, helped by the willingness of participants to follow instructions designed to minimise congestion, avoid disturbance to local residents, livestock and wildlife, and prevent littering. Around 120,000 people are estimated to walk the Great Ridge annually, making it one of the UK’s most popular walks. By promoting Mend Our Mountains: Make One Million the Light Night will benefit the landscape by repairing erosion on the route, along with the 12 other main projects that are part of the appeal. We’d also like to give a big thanks to our partners. Mend Our Mountains: Make One Million receives fantastic overall backing from Cotswold Outdoor and Snow+Rock, who provide headline sponsorship for the appeal and helped to drum up support for the Great Ridge Light Night. The Great Ridge Light Night itself was made possible by the magnificent support of The Camping and Caravanning Club, a founder member of the BMC. The event also launched National Camping and Caravanning Week (NCCW), an annual celebration of camping and the great outdoors which runs this year from May 28 – June 3. Jon Chittenden’s long exposure photo of participants in the event.